The Phoenix of Alpha Sigma Alpha magazine encourages members to submit news and photos for consideration in upcoming issues. Alpha Sigma Alpha is always open to considering ideas for articles from members. Article ideas can be educations features, member spotlights, general themes, etc. Please submit a brief description of your idea and contact information for a potential author. We encourage any member to submit news and photos as your chapter has news, celebrations and information to share. To submit news, upload a high-resolution photo (minimum 500 KB) and provide a brief description including who is in the photo, what is happening, when and where the news took place and why the news happened. The word palm means tribute, honor or praise. 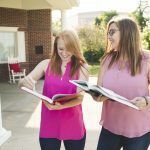 Alpha Sigma Alpha gives palms to alumnae and collegians for their success and milestone. Are you or a member you know celebrating a personal, professional or volunteer success? Tell us about it by submitting the member’s name, email address and a brief description of the success or milestone. The woman of poise and purpose is featured on the back cover of every issue. The women of poise and purpose should be a member who makes a difference in her community by leading and serving. Nominate a member to be featured by submitting the member’s name, email address and a brief description of the work she is doing to make a difference. While it is always sad to hear about the death of one of our sisters, we appreciate you for letting us know. The memorial list is printed once a year in the fall issue of the Phoenix. Please provide as much information as possible. Be sure to include the work she is doing to lead, to serve and most of all to make a difference.